A book of the depressing memories of Adeline as she embrace adversity in her younger days. The moment she was born her mother passed away which devastated her and her whole family resulting them labelling her as bad luck. She was often bullied by her other siblings and was once tricked into drinking urine. 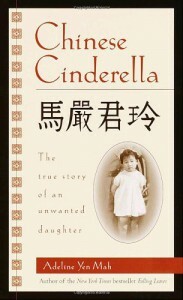 Her father was a wealthy man and was soon married to a foreign woman. Sadly in her childhood Adeline was not shown love by her parents unlike all her other siblings . But instead was taken care of by her grandfather along with her aunt . Life was not always on her side . She lived in Shanghai but was soon moved to Hong Kong . That is when life took a turn for the better for her as when she studied at a boarding school there she joined a writing competition and unexpectedly won . Soon her potential was recognized by her father which then sent her to England to study. Slowly but surely she soon began publishing books that drove her to a successful life . Adeline has been an aspiring character in this book as she battled her way through the hard times she had and despite not being showered with love by her parents unlike her other siblings she still did not make it an excuse just to live her life as it is. She always had a dream to be in a better life . This book has opened my eyes , as it teaches us to appreciate those little things in life and to constantly show love to others which may turn their live around. To grow and forge your character to embrace adversity and to turn your life into a success this book just has it all. For all those readers expecting the unexpected in a non fiction book this book is surely for you without a doubt .